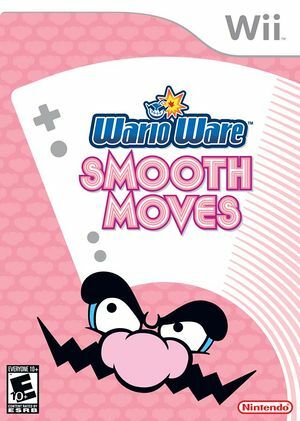 WarioWare: Smooth Moves is a party video game developed by Nintendo SPD and Intelligent Systems. It is the fifth game in the WarioWare series of games. Like its predecessors, WarioWare: Smooth Moves is built around a collection of microgames that last about five seconds each, and which require that the player hold the Wii Remote in specific positions. The game offers the microgames to the player in rapid succession, by first instructing the player to hold the Wii Remote in a specific manner, and then showing them the microgame. The microgames are divided into several stages, which each loosely connect the microgames with the help of a story. Dolphin defaults to 16:9 for Wii games; however, this game only displays in 4:3, causing a distorted image. Change Dolphin's aspect ratio to Force 4:3 to correct this. This has been fixed; keeping Dolphin's aspect ratio set to auto will display the game in 4:3. FMVs may experience mild graphics errors in some places when Texture Cache Accuracy is set to Fast. To fix this set Texture Cache Accuracy to a setting other than Fast. The Widescreen Hack is ineffective with this title. This Gecko code will setup 16:9 rendering. The graph below charts the compatibility with WarioWare: Smooth Moves since Dolphin's 2.0 release, listing revisions only where a compatibility change occurred. 3.0-188 Windows 7 AMD Athlon II X3 435 ATI Radeon HD 5770 Perfect.